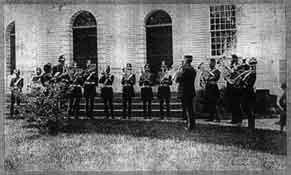 The original Old Lyme Town Band existed from 1886 to 1910. The band members practiced in the "Band Room," a building on the corner of Shore and Ferry Roads that has since been converted to a residence. In the summer of 1975, Michele Smith Dickey, a granddaughter of one of the original band members, reformed the band in anticipation of the US bicentennial celebration. Michele took lessons on a trombone which reputedly belonged to a member of the original Old Lyme Town Band. Donald Janse, then director of cadet musical activities at the US Coast Guard Academy and past director of the Coast Guard Band, was the first conductor of the modern band. Since 1975, the band, whose members represent many area towns, has presented concerts from Guilford to Mystic, and from Old Lyme to Middletown, particularly during the summer. Rehearsals are held Monday evenings from 7 pm to 9 pm, at Christ the King Church in Old Lyme. New members of all ages are welcome with no auditions. For further information, contact us.